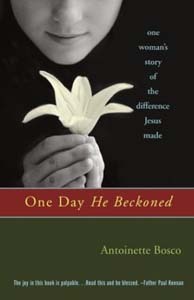 My next new book, a spring publication of Ave Maria Press is called "One Day He Beckoned, One Woman's Story of the Difference Jesus Made." This book is very special to me because I have, very honestly, gone back to an experience I had at age 15 that truly shaped my life. In that experience, Jesus beckoned to me--and that was the beginning of my life-long love affair with Him. I've been through the hurricanes, the floods, and the volcanos, and under the sun, the soothing rain, and perfumed breezes. Life always threw its curve balls, some hitting me deeply in the heart. I worked non-stop for my family, my Church, my world and myself. Sometimes the good things in my life would fall under shadows, leaving only a self-pity that would soon disgust me, even as I justified it, whispering that I was only human. But I'm at an age now where I look back at all my difficult life and I say loudly, no regrets. I see so clearly that without difficulties in our lives, we can never feel compassion for others. If we don't feel compassion, we have missed the great plea that defined the life of Jesus-that we love one another. Jesus beckoned, and I took his hand, not knowing at age 15, the challenge I accepted when I said yes to his invitation to "Follow me." He was a radical, presenting a message like nothing ever heard before, teaching that God and humans are connected in an intimate way. He altered all the accepted "eye for and eye" kind of teachings people had long accepted to show everyone, then and now, that they were supposed to think and act in a radically different way-in truth, God's way. He respected women, and by-passing male attitudes of the day, regarded them as intelligent people who were as privvy to his teachings as were men. Jesus came to "show us how to make the world right" and didn't plan to preach and move on. He came to stay forever. He beckons to us with a hard offer. You follow me and I'll give you a heart transplant so you can be me. That's the Jesus who shaped my life, and I'm not alone. I've met so many people who have been Jesus to others, who have carried out his work so strongly that they bring heaven into full view. They have convinced me that until we know Jesus, we have little chance of understanding the grandeur of which we are capable-and our true destiny, so well expressed by C.S. Lewis: "What we have been told is how we can be drawn into Christ-can become part of that wonderful present which the young Prince of the universe wants to offer to his Father-that present which is himself and therefore is us in him. It is the only thing we were made for. And there are strange, exciting hints in the Bible that when we are drawn in, a great many things in Nature will begin to come right. The bad dream will be over: it will be morning." Alleluia and amen!